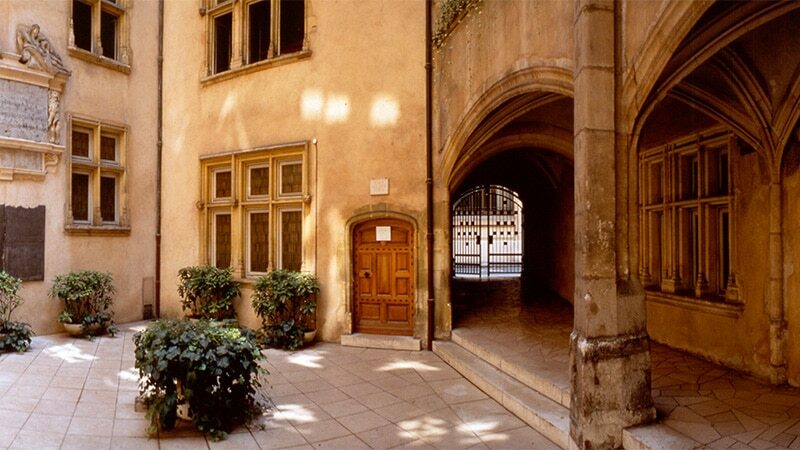 The Museum of Printing and Graphic Communication is housed in a 15th century building in the center of Lyon and contains just as much history on the inside, with artifacts ranging from the oldest printing presses to the latest in graphic design and advertising. The Museum of Printing and Graphic Communication sits in a 15th century Lyonnais building in part of the UNESCO World Heritage Area of Lyon. 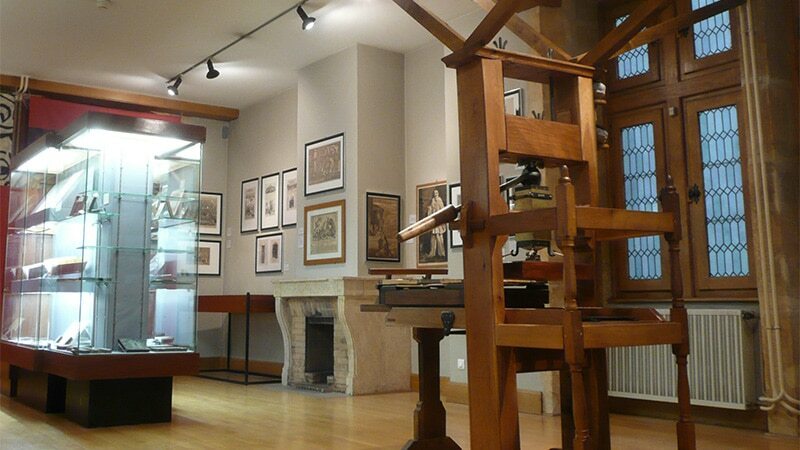 The Musée de l’Imprimerie et de la Communication Graphique, or in English, the Museum of Printing and Graphic Communication, is situated in the heart of Lyon’s 2nd arrondissement steps from the Cordeliers metro. 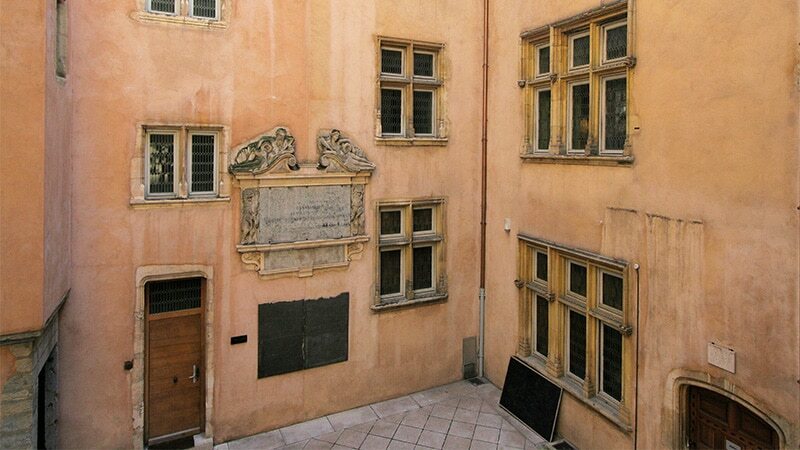 One of Lyon’s many museums, it was founded by master Lyonnais printer Maurice Audin in 1964. It began as a printing museum and added graphic communication in 2014 as its collection grew. Lyon has a storied history in the printing industry. Many of its streets are named after famous printers like Sébastien Gryphe and Barthélémy Buyer. During World War II, Lyon was a stronghold for the French Resistance and its printers produced many Resistance newspapers. The Lyon Museum of Printing and Graphic Communication is founding member of the Association of European Printing Museums, run by its president and former museum director Alan Marshall. The Lyon museum is now run by Marshall’s successor, Director Joseph Belletante. The museum’s rooms take visitors on a trip from the beginning of printing and the Renaissance all the way through the industrial revolution to modern-day photography, graphic design, newspapers, computers and more. The museum houses artifacts from all eras of print and graphic communication, including printing presses, camera equipment, and more. 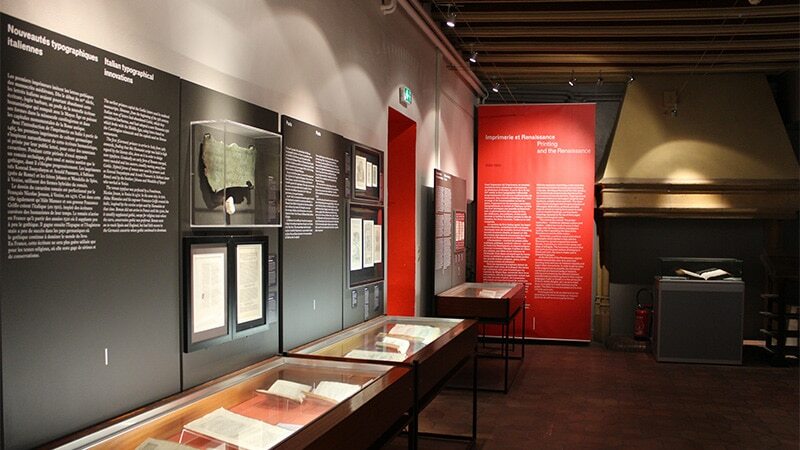 Among its most prized permanent installations is a leaflet of the Gutenberg Bible, the first book printed in Europe. But in addition to its books and printing presses the museum also houses more modern creations, including typewriters, posters, famous advertisements for companies like Rudge bicycles and Air France, and even a 1990 Macintosh Classic computer. Lyon was once the European capital of printing. The industry first came to the city in 1472, and printing shops once lined the street of Rue Mercière, just down the road from the museum. Lyon produced books in many languages, ranging from its native French to Greek, Latin, Italian, Hebrew, and Spanish. It quickly became one of the most important centers of print production in all of Europe. In between Place Bellecour and Place des Terreaux, the Museum of Printing and Graphic Communication is housed in the former town hall of Lyon, or Hôtel de Ville. The current Hôtel de Ville is now up the street in the 1st arrondissement, at the famous Place des Terreaux. The museum contains Lyon’s history as the European capital of printing, from the invention of the Gutenberg to modern day books and photos. The building was built in the 15th century as a private home that passed through the hands of the city’s ruling merchant families. The museum building itself forms part of one of Lyon’s famous traboules, linking Rue de la Poulaillerie with Rue des Forces which sits just behind it. It became the town hall in 1604 when the original one, around the block at 3 Rue de la Fromagerie, was too small for the growing city. The Hôtel de Ville stayed at Rue de la Poulaillerie until 1654, when the building passed through private hands until it was sold to the City of Lyon in 1956. 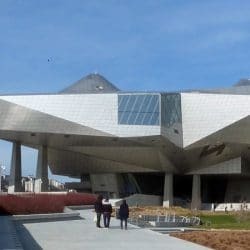 The museum was opened eight years later. Although it has been restored since its days as a private residence, the building still has old-world character including vaulted and crisscrossed beams, a courtyard, and a spiral staircase. The plaque in the courtyard is a copy of the one that now sits in the Museum of Gallo-Roman Civilization and contains the text from Emperor Claudius’s speech in 48 A.D. The plaque in the courtyard of the Lyon Museum of Printing and Graphic Communication is a copy of Roman Emperor Claudius’s speech. The museum and historic Rue Mercière printing district make up part of Lyon’s UNESCO World Heritage area, designated in 1998. Alongside its permanent collection the museum hosts one large exposition and one smaller exhibit each year. It also organizes design workshops for typography, engraving, illumination, calligraphy, silkscreen, and binding. The Museum of Printing and Graphic Communication gives visitors a taste of old-world Lyon in its charming building full of winding stairs and arches. Inside, visitors find the city’s rich history of printing and graphic design at their fingertips, ready to be rediscovered. Groups can make an appointment Tuesdays through Sundays, so they have the museum all to themselves. After your visit, head through the traboule to eat at the famous restaurant Le Musée on the other side. 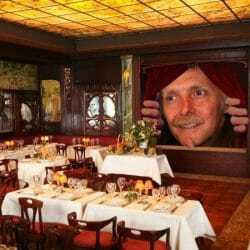 Legend has it that former Lyon mayor Edouard Herriot would dine at the restaurant and visit the “maison close,” otherwise known as a brothel, located on the same street. The Rue Mercière printing district is only a 5-minute walk from the museum. Head over there to see where the printing shops stood. Now the street is full of restaurants, so you can grab a bite to eat here too. For children under 18, disabled persons including their guests, unemployed individuals, RSA-RMI beneficiaries, City of Lyon employees, and Friends of the Museum. The Millenium Falcon of Lyon. Discover Lyon’s audacious and eclectic Natural History Museum, at the confluence of the city’s famous rivers. This museum is unique in Europe and shows everyday world in tiny, pulls you into the realms of cinema and its special effects. 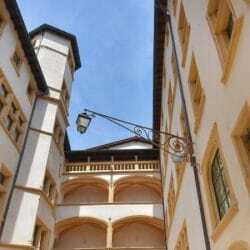 Located in the old quarter in Lyon St Jean in a Renaissance building, the Musées Gadagne comprise two truly beautiful museums: the Historical Museum of Lyon and the newly refreshed Museum of Puppetry Art.